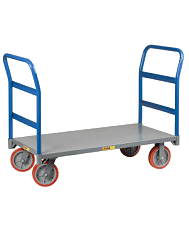 Take the back breaking work out of moving heavy objects with our new Power line of carts featuring EcoDrive, a “green” and environmentally friendly power source - no gas powered motors mean no emissions! Fully charged unit will last through a days worth of normal use. Level Ground Capacity: 750 lbs. 3:1 Incline Capacity: 500 lbs.